And so, this summer, I was at Church camp surrounded by good children who came from respectable families and wore nice clothes and memorized their verses for Sunday School each week . . . And I felt different. And I cared. One night I fell asleep in a troubled, fitful manner, half-listening to the loud, uneven air bursts of the cabin fan. Normally I liked sleeping to the sound of a fan—to the pleasant even flow that kept out the silence of night. But this one bothered me. It troubled me, in fact. And, waking in the wee morning hours, I realized just how much. I was wide awake and frantic. Crying. And then sobbing. The whirring fan was no longer just that. It had become the death-sounds of my father. Intensely real to me at that moment was the imagined reality that Daddy had died gasping for breath, in loud, haltingly uneven breaths. The fan motor grew increasingly louder to my ears, and I was seeing Daddy sitting there in the car, gasping, with no one able to help. The next morning things were normal again. Life was normal, inasmuch as it ever is. But I knew I had had one of my moments, one of the snippets of time that would stay locked in my memory, hidden away. Until it had to come out in words. And why did it? Why does anything have to be put to words, written out? In the beginning was the Word. And the Word was with God. And the Word was God . . . There is of course a power in the speaking of something. A making real. A healing. A moving on. And so we speak the words, and write the stories, and sing the songs. 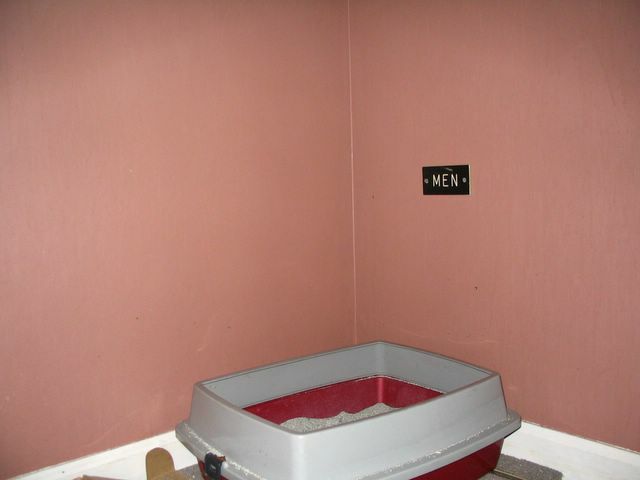 Before heading out for work this morning I was, as is my custom, vacuuming up the stray litter from the “men’s room” [see illustration above] of my apartment. I lifted up the entrance mat to get at the area beneath it, and then paused, perplexed. After staring for a moment at the oddly-shaped little mass that I found hidden there in the dimly lit hallway, I peered more closely. And what I discovered made me laugh. Yesterday evening I thought I was losing my mind. After several months of being rather smitten with this new herbal tea—lavender chamomile—that Mom first gave me for Christmas, I have been replenishing my own supply so that I can enjoy a nightly cup of it. This would be fine, except for my recent nagging conscience about the fact that I am spending a pretty penny on this fancy tea. I mean, each one of these little tea bags is a work of art, I dare say. Seriously, even the shape is artistic—a little diamond instead of your average little tea-bag-square. And instead of the normal papery filter, these bags are surrounded by a sheer, finely-woven, shimmery mesh. Well, it was love at first sight—and I hadn’t even tasted the delicate chamomile with its lavender aroma when I first held up that tea bag to gaze at it . . . So you get the point. At any rate, it’s a pricey little purchase, considering I drink it basically nightly. Well the other day, I decided I should just start reusing the bags—just once—as the tea brews quite strongly. This way I could still enjoy the tea but get double the value. So I just steeped it for slightly less time then removed the bag and placed it on a plate on the counter—to use the next night. But last night I came home to an empty place. There was the place I had—so I thought—laid the tea bag. But it was most definitely not there. My final conclusion was that I had only imagined myself placing the bag on the plate, while in actuality I had thrown it away out of habit. But no, I had placed the tea bag where I thought I had. It simply had never occurred to me that Aslan could get onto the countertop. He can. And he did. And he decided that my little saved tea bag was the perfect toy for the day. Now whether he purposefully hid it under the mat to save—hidden—until I was gone again, I suppose I shall never know. Then again, do all cats go to heaven? Hmmm . . .
After class ended this evening, I was reading one of my child lit books when I was distracted by a thought–or, rather, by an image. It got me thinking about grief–specifically, the grief of a child. I am not sure the thoughts are coherent, but perhaps putting words to them will make them more so, so I will try. The image is a memory. One of the few times as a child that I was able to cry–to really cry, in the gut-level, wrenching manner that I needed to. Most often, as they do, these tears were prompted by one of 3 things: words, music, or beauty. Or, even more often, by a combination of 2 or more of these. What I was going to say [‘when truth broke in with all her matter of fact about the ice storm’] is that this particular summer, as a camper of 10 or 11 years old, I had spent the 2 week session particularly gravitating towards one of the counselors. I was never bold enough to outwardly display it, but I just found a way to be near him, somehow, at open-camp events and downtimes. It wasn’t exactly a conscious response . . . just a twinge of bittersweet longing his presence brought out in me–that sort of sadness that hints at something greater than our own somewhat stifling selves. Towards the end of the session, during evening free time, a group of us were sitting around outside with our snacks, and this counselor got out his guitar. I do not remember what he was playing, or even what his voice sounded like. All I remember is watching his face, listening to his voice, and then suddenly, in spite of myself, losing all of my normal calm control. I was a shaking, wailing mess of a little girl. And, even at the time, I was immensely relieved at the ability to let out that pain that had been pressing against my heart all that time. You see, something about this young man’s voice, face, manner, or combination thereof, brought back to me some remnant of my father. And so, I do not know how much he actually looked like, or sounded like Daddy, but regardless, I needed that heart-nudge in order to begin to start what would be, for my heart, at least, a long and drawn-out process of grieving. At the time, I ended up crying so desperately that my worried counselor ushered me away to the nurse’s cabin, so I could continue my crying for some time yet, in peace and under the kind care of the nurse. But I really did not mind. I remember trying, in between sobs, to assure them that I was ok, really . . . that it was ok . . . that, in fact, I was more ok than I had been for some time. Because I was. That was a sort of a pattern that continued for quite a few years–long periods of stoic quiet seriousness followed by moments of letting-it-all-out. And eventually, adulthood crept up on me. And somewhere between then and now I began to stop needing to grieve for my father, and began to live and to grieve for situations in my own life, or in the lives of people in my life. But I do believe that we each play a role in the lives of children around us. Who knows but that we may, at any moment, be an impetus for some child’s growth into the adulthood they need to reach. Or that we may provide some child with an outlet for the grief she needs so desperately to get out. Or the comfort she needs while grieving . . . What I do know is that we cannot, must not, underestimate the depth of children’s emotions and experiences, as adults are so often prone to do, in our impatient busybodyness, bustling about through life. Oh, I do forget this so very often . . . and do resolve to be more mindful, more careful, more caring, in the future . . . Thank you, Jesus, she said, for showing me your face in the face of this man . . . And thank you, for giving him to me. And she washed his feet. Gently. Looking up at his face as she did so, from where she knelt. Watching, I felt the familiar sweet ache in the gut that comes from the sight of exquisite beauty. In this case, the beauty of a marriage–a blessed marriage. These two have walked through twenty-some odd years of their lives together and still are moved to tears when expressing their love for each other. Somehow, this portrait was a fitting end to my commemoration of the Friday we call Good. I saw Christ’s face shining vividly in the faces of this couple, and felt the sweetness of quiet fellowship in that, our own Upper Room. This literal acting out of the practice of footwashing brought forth, mysteriously, the figurative reality it hints at. And promise. If two people so beautiful as these can make their way through the world, perhaps there is some hope yet for glimmering moments of goodness to spring forth from our messy, yet cleansed, selves. Vexed my soul with strife. I’ve solace in Interlibrary Loan. A professor’s response to my latest assignment left my mind darting rapidly in every which direction, desperately trying to figure out what it was I was trying to get out. I tried to go to bed, without much of a desire to do so. But I just laid there, restlessly, feeling as though I needed to somehow give birth, figuratively speaking, and yet not knowing what sort of child I needed to bear. This is the sort of sleeplessness that does not need to be soothed to sleep; this is the kind that needs to be nurtured, coaxed until it can release the creative seed pushing its way forth. And so I talked to myself, asking what it was that I needed to focus this energy on once I booted the computer back up again. Before too long I realized what it was that was itching to be put to words. My professor complimented my latest paper and commented that perhaps it was time for me to “tell [my] own story.” I was amazed that she could pick up on what I have been personally dwelling on for the past several months. And then it occurred to me that I have, in a sense, been telling other people’s stories. With their permission, mind you, but other people’s stories all the same. I am too cowardly to speak of my own story—not in the sense of the story of my family, obviously, but in the sense of my own deep hurts and fears, through decisions I have made and steps I have taken along the way. So, to you who may be reading, I will forewarn you that I am now going to tell one of my own little life stories, and one of the lessons I have learned thus far in my admittedly sheltered and nerdy little life. . .
For 2 ½ years, my life, internally and externally, had revolved around his. When we were happy together, I floated on air, fearlessly tackling all that life could throw at me. And when our relationship was strained, I withdrew into a brooding cavern of melancholic tendencies, so that my life could fall to pieces around me if it so desired. We started dating my sophomore year of college—his junior year, after spending the year working together as Intervarsity Bible Study leaders. During that year we had spent much of our spare time around each other, if not technically with each other, and so our relationship flowed naturally once we started purposefully sharing each other’s company. It began with evening walks around campus and the surrounding neighborhoods, and then one night, he was more formal that usual, asking if we could “talk.” Well, of course–we always talk, I thought, suspecting all the same—and in disbelief that he could share my feelings surrounding our relationship. Could it be that he were really interested in my? Well, he was, and thus began our relationship. Over the next several years, we shared our families, road trips, out-of-the-country trips, and lives with each other. And, as happens so naturally, we grew to love and rely on each other. After some time, in a period of heightened family turmoil, I began to 2nd-guess everything, and grew restless in that, the only relationship I had been in thus far. You see, I was a very inexperienced young woman at that point, and naïve in my inexperience. And so I made light of our relationship and discounted the hurts I could cause him when I was brutally honest about all my misgivings, uncertainties, and dissatisfactions with our relationship. Somehow, I thought what I did couldn’t really impact him so much. I had some sort of twisted insecurity that made me disbelieve that I could really impact someone else’s life. But of course, we all impact each other immensely, like it or not, and the little things we do and say have great repercussions in the lives of those around us. So, eventually, my wavering uncertainties took their toll. By that point, we were planning for marriage, considering whether to live in his Northwest hometown or in my Southern one. Job interviews for me there and phone calls made from him down here. But my heart was not in it. I was going through the motions and not sure what was wrong internally. As I was getting ready to travel through France for the summer, putting the finishing touches on my senior thesis, I asked him for some time—time to not communicate with each other, but just to think through it all so we knew where we each were emotionally when I returned. What I did not realize until my return was that he did not understand why. I thought I was asking for some pre-marriage reflection time, knowing that, as an extreme introvert, I had to process thoroughly every minutiae of my life. He thought I was rejecting him, in a sense: telling him I didn’t care enough to want to communicate with him, and telling him I was not sure I wanted to stay with him. And so, for 2 months, I traveled, researched, wrote, and thought. And for 2 months, he stewed, and grew to rely emotionally on other female friends in my absence. I had some notion that he would read into all my internal processing, and did not worry about ever really losing him. When I came back, I was filled to overflowing with self-realizations and new inspirations, ready to run to his waiting arms. I knew now how wrong I had been, all that time. I had mistreated him, telling myself that he would always be there no matter how much I pushed him away periodically to pursue hobbies or passions without him for a time. I also wrongly thought that I had to be involved with someone else in order to be unfaithful to him. But in fact, I was unfaithful to him in my devaluation of his reaction to my internal life. I also realized that I had not wanted to fully give him my heart because I selfishly wondered if, just maybe, there was something, someone, more perfect out there, considering the fact that ours was the only relationship I had been in. But, reality is such that it is the mundane that makes for the magic of life. There is not some perfect someone out there for any of us—just a bunch of other bruised souls. Some of us just happen to get along well together, and we have lives that can mesh well enough to stumble along this wearisome, and wonderful, path of life together. As for that particular time of my life, I ended up with a heart that was rejected for the first time. When I returned from France, I could no longer reach him. For the first time in our years together, we were simply coexisting in space together rather than sharing it. He had become convinced that, as his mother had advised him, I “could not love him the way he needed to be loved.” And so he closed his heart off to me. He was a good man, a conscientious man, and so he did it well. He suggested that perhaps we should end it, and awaited my reply. And my dam burst open, and I cried for weeks, knowing that it did not really matter what my reply would be. But, in his goodness, our gracious Father saw fit to give me peace all the same. After a few weeks of the tears, I was dry-eyed and out for a run when, suddenly, the floodgates opened again. I wept as I ran, and I knew it was time to let him go and that, not only that, I was ready to do so. So we parted ways. Mind you, I was not so together as to heal once and for all after that. I let myself end up in a small string of whirlwind relationships without fully healing so that, in the long run, I ended up backtracking and healing from that initial breakup during a years-long spell of singleness. It made for a long and drawn-out process of healing. But it also ended up allowing me the emotional freedom to really figure out what it is that I am here on this earth to do, and which me I am meant to be, for however long I am meant to inhabit a little pocket of this earth. PaCharley tells us a story as we celebrate his 78th birthday this evening . . . and GramBea says, “Now Charley, really!,” or something to that effect . . .
Africa is on my mind today, after the gathering last night, in which I had the pleasure of conversing with a delightfully eclectic bunch of others who are either native Africans or, for various reasons, have lived somewhere on that vast continent. So, I am now perusing a learning-Swahili handbook I borrowed–we’ll see how I progress in that. When we moved to the U.S., he was 5 years old–old enough to be his characteristically precocious self but not yet old enough to fully comprehend things such as race and ethnicity. So, upon our arrival, he heard, for the first time in his life, the term “African American.” His little mind processed that term, thinking “Hmmm . . . I was born in Africa and now we are here in America. That’s what I am–I’m an African American!” And that is how he spent the first year or so here in the U.S.–proudly introducing himself, and my younger brother [both blond and green-eyed] as “African Americans” to any strangers he may happen to encounter. This lasted until some adult heard the comment and wisely warned Alex against continuing such a potentially imflammatory habit . . . If you ever travel to a small village called Mukinge, in Zambia, Africa, you may want to practice this phrase–Mundeka leka mambo mwane. Kechi nayuka kikaonde ne. What, you mean you want further explanation that that? Okay, fine. That means “I’m sorry Sir/Madam, but I do not speak kikaonde.” And, I specify that this phrase will only be useful in that particular village because I’m afraid it is only one of, at last count, 72 different tribal languages in Zambia alone . . .